Our previous post contains more background on the case, but in short, the parties’ dispute centers around a mural that adorns a Detroit parking garage. Adrian Falkner, a respected mural artist, created the work (with permission from the property owner) in 2014. In 2016, the work was featured in a Cadillac social media marketing campaign; Falkner was never contacted or compensated. So he sued for copyright infringement (and added a claim for removal of copyright management information, pointing to Cadillac’s decision to use a photo that didn’t include his signature). His complaint sought an accounting, punitive damages, and injunctive relief. GM moved for summary judgment, pointing to a provision of federal copyright law, 17 U.S.C. § 120(a), which provides that a “copyright in an architectural work that has been constructed does not include the right to prevent the making, distributing, or public display of pictures, paintings, photographs, or other pictorial representations of the work, if the building in which the work is embodied is located in or ordinarily visible from a public place.” The purpose of this provision is to clarify that anyone may freely take a photograph of an architectural work without infringing a copyright in that work. 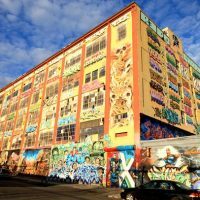 GM’s argument was essentially that, because the mural is incorporated into a publicly-visible building, GM cannot be liable for simply photographing that building. Last week, the court took the opportunity to examine how a statutory exception for photographs of buildings should apply to artworks on those buildings; ultimately, the court rejected GM’s reading of that statute. The court then discussed a previous California case, Leicester v. Warner Brothers, No. CV-95-4058-HLH(CTX), 1998 WL 34016724 (C.D. Cal. May 29, 1998), which dealt with a similar question. There, the artist who had designed the towers on the “street wall” surrounding a building sued after the towers were depicted in a film. The district court dismissed the artist’s claims, ruling that the towers were a part of the architectural design of the building and therefore could be freely pictorially reproduced under the § 120(a) exemption. The Ninth Circuit affirmed, but in a decision that resulted in three different opinions reflecting varying reasoning. Falkner’s case, the court ruled, was distinguishable from Leicester. In Leicester, the court observed, the towers were part and parcel of a unitary architectural work (the overall building). They were integrated through the use of the same materials, continuing lines, and coordinated spacing of design elements as between the building and the towers. The towers served a functional purpose for the building (by channeling traffic flow to the building through gates attached to the streetwall). They were built simultaneously with and coordinated with the building’s original development . Here, in contrast, the mural itself was clearly not an architectural work; and under an analysis similar to that in Leicester, the court ruled that mural was also not “part of” the architectural work of the parking garage. There was no indication that the mural was designed to appear as part of the building or to serve a functional purpose that was related to the building; rather, Falkner had total creative freedom with respect to the mural; the mural was created after the parking garage was complete; and the mural served no functional role in, and displayed no design integration with, the overall parking structure. The court’s ruling on this point allowed it to avoid larger questions about “conceptual separability,” which had been discussed but not definitively decided in Leicester as well. The court simply ruled that Section 120(a) did not apply at all to the mural, because the mural was not part of an architectural work as a matter of law—therefore, there was no reason to further analyze whether Section 120(a) permits photographs of the mural. Falkner’s claim for removal of copyright management information did not fare as well. The court held that this claim failed because GM had not “removed or altered” anything from Falkner’s work or even from a photograph of the work, but rather, had simply chosen to frame the photograph in such a way that the relevant identifying information wasn’t visible. Finally, the court held that, should Falkner prevail at trial, he is not entitled to punitive damages. In sum, last week’s ruling trims back Falkner’s claims and potential recovery, by rejecting his claim regarding copyright information removal, and by precluding punitive damages. But the heart of the suit—the pure copyright infringement claim—can proceed. The state of the law is still somewhat unsettled as to when § 120(a) might protect photography of artwork on buildings, but the criteria the court examined would likely apply to many works of graffiti art, because such artwork is often not an integrated part (either design-wise or function-wise) of the building on which it is created. A jury trial has been scheduled for this coming February. We’ll continue to follow the case, and any potential appeal (which could be interesting, given the court’s lengthy discussion of the Ninth Circuit’s ruling in Leicester). For now, another graffiti artist’s case survives legal scrutiny—and companies who might be tempted to use graffiti art to promote their own products have another reminder of the risk of liability.